In this game of Turkish origin, both players come their men in the same manner. 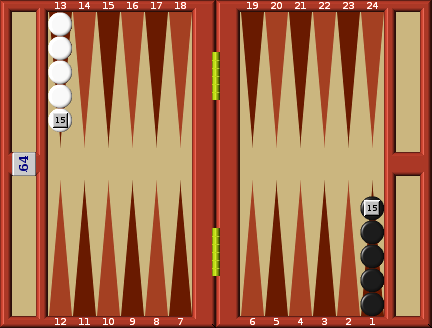 The game is distinctly different from conventional backgammon in that men are not sent home. The primary strategy should be to create a prime in order to block your opponent. Following this, running and bearing off are in order. The play starts with each player rolling one die. Highest roll wins the first play. The winner then rolls two dice to determine his first move. Both players must get to their own outer board with their first man before moving a second man from the starting point. The key to strategy in this game is to create a prime in order to block your opponent. However, one of the rules of the game is that you cannot create a prime commencing at the starting point of your opponent. In this section of the board you must leave one point open. In other words, you must have a break in your prime. Obviously, you should try to get as many men as possible moving from your starting point. In so doing, you will have more men available to play with and consequently will have more of a chance to create a prime along the way. To create a prime on your opponent's home board is ill-advised, for by the time he brings his men to his outer board waiting to come in, you are farther from home than he is.